BRUSSELS, Belgium, 2017-May-19 — /Travel PR News/ — Radisson Blu is the proud winner of the 2017 IMEX-GMIC Innovation in Sustainability Award with its Blu Planet program, the responsible business initiative of Radisson Blu hotels around the world. Radisson Blu is a part of Carlson Rezidor Hotel Group, which also includes Quorvus Collection, Radisson®, Radisson RED, Park Plaza®, Park Inn® by Radisson and Country Inns & Suites By Carlson℠. For reservations and more information visit, www.radissonblu.com. Connect with Radisson Blu on social media: @RadissonBlu on Twitter and Instagram and Facebook.com/RadissonBlu. Carlson Rezidor Hotel Group is one of the world’s largest and most dynamic hotel companies and includes 1,440 locations in operation and under development with more than 230,000 rooms and a footprint spanning 115 countries and territories. The Carlson Rezidor portfolio includes a powerful set of global brands: Quorvus Collection, Radisson Blu, Radisson, Radisson RED, Park Plaza, Park Inn by Radisson and Country Inns & Suites By Carlson. Guests can benefit from Club CarlsonSM, a program that redefines hotel rewards with a collection of exceptional benefits, services, and privileges at more than 1,000 hotels worldwide. Over 95,000 people are employed in Carlson Rezidor Hotel Group hotel systems and the company is headquartered in Minneapolis, Singapore, and Brussels. 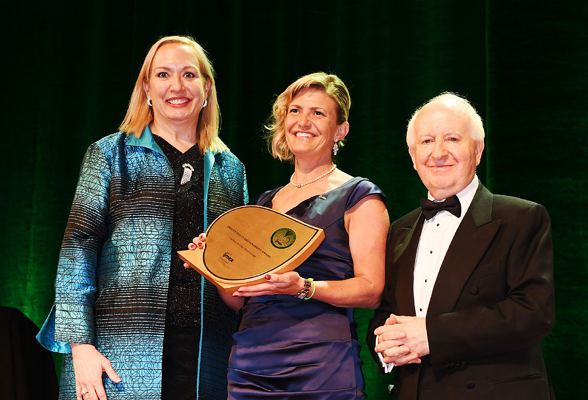 This entry was posted in Business, Hotels, Resorts, Travel, Travel Awards, Travel Management, Travelers and tagged 2017 IMEX-GMIC Innovation in Sustainability Award, Blu Planet program, Inge Huijbrechts, Radisson Blu, wins. Bookmark the permalink.